With spring approaching the weather on the East Coast has made a rapid transformation. However Earth isn’t the only planet with seasons; we observe tropical storms on Titan and Neptune’s gusting 1500 mph winds. While the Earth’s weather system is both complex and diverse, we have a rather small sample size of one. Meteorology of other planets in our solar system provides critical laboratories for testing our climate models, studying new weather mechanisms, and developing climate theories for other worlds. This particular paper discusses a method for identifying Carbon Dioxide (CO2) clouds on Mars using infrared spectroscopy. To study clouds on Mars scientists might use remote sensing from spacecraft orbiting the planet or data from surface missions. Observations from one instrument will have biases from the craft’s spatial position and orientation as well as intrinsic limits on what information is contained in the data. For instance, the OMEGA instrument on ESA’s Mars Express orbiter captures the distinct CO2 spectral feature at 4.26 microns (wavelength of 10-6 meters). The basic idea is that if a cloud’s spectrum includes this feature it is composed of CO2 ice rather than H2O. However, OMEGA has a resolution of about a kilometer which makes studying the microphysics of CO2 cloud formation difficult. The three boxes that make up CRISM and take care of the mechanics/pointing (GME), optics (OSU), and data processing (DPU). Image from CRISM webpage. Enter the Mars Reconnaissance Orbiter’s imaging spectrometer, CRISM. This instrument has a much finer resolution of 20 meters allowing for detailed spatial analysis. 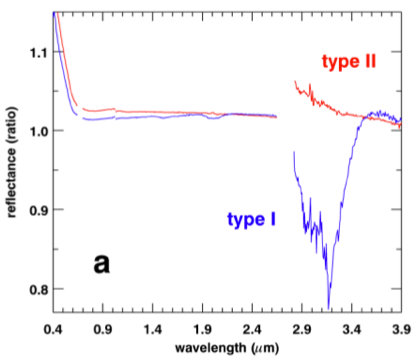 However, CRISM was not designed to detect 4 micron light and therefore the spectra it takes do not include the identifying CO2 spectral feature at 4.27 microns. The crux of the problem is that while CRISM would allow you to study fine details of CO2 clouds, you cannot definitively identify them without a different instrument such as OMEGA. The solution presented in this paper relies on the relative complexity of H2O and CO2 cloud spectra to discriminate between water and carbon monoxide. Using data from CRISM, the authors found about 200 observations with atmospheric clouds and using the spectra made 2 cloud categories. The difference between the two categories is the existence of an absorption feature at 3 microns attributed to water ice. Example spectra of the two cloud categories. One type has a strong feature at 3 microns while the second does not. Figure 3 from the paper. The clouds do have water ice, but CRISM does not detect it. Suppression of the feature comes from the cloud’s attributes. The clouds do not have water ice. Therefore, assuming that there are only two types of clouds (H2O or CO2), process of elimination implies that the cloud is made of CO2. To test the first hypothesis the authors calculate the theoretical spectra for clouds with different grain sizes and optical depths. From these results the authors conclude that all the ice water clouds they detect should should exhibit the 3 micron water feature. In essence, the method uses the absence of a feature indicative of ice water to identify CO2 clouds; rule out a water cloud and you’ve found a CO2 cloud. Images of different cloud shapes observed by CRISM. The straight filaments (1) are found to be composed of carbon dioxide while the blotchy round clouds (5) are composed mostly of water ice. Figure 14 from the paper. Applying this technique, the authors find 54 observations of CO2 clouds. Using CRISM’s good resolution with other observations a host of interesting questions can be investigated. What is the spatial distribution of the clouds? When do the clouds appear? For how long do they persist? Where in the atmosphere are they formed? What are the morphological features of these clouds? Peeking at the above figure you can see the continuum of observed cloud shapes from straight strings of CO2 clouds (1) to splotchy blobs of ice water clouds (5). While the different geometries are affected by the instrument’s viewing angle, the authors report a strong correlation between a cloud’s shape and its composition. Among other things, I'm a second year Astronomy graduate student studying the birth places of stars and planets.